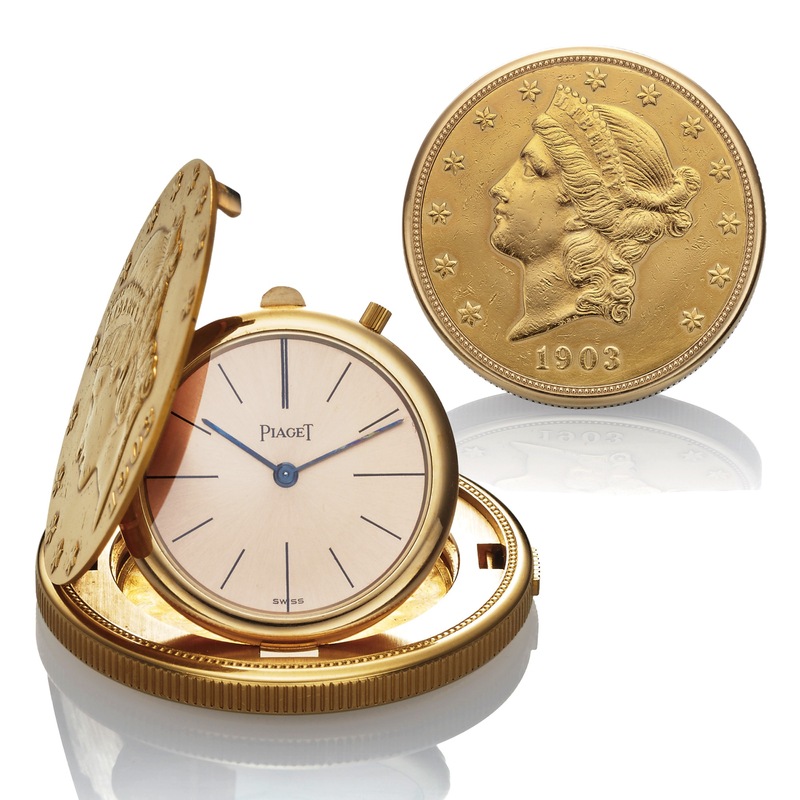 PIAGET TWENTY DOLLAR GOLD COIN WATCH Piaget, 'Twenty Dollars 1903', movement No. 7317018. Made in the 1980s. Very fine, 18K yellow gold $20 U.S. coin dated 1903 with concealed watch. Accompanied by a pouch. Double case, coin opening with a concealed push-piece in the band, three-body hinged inner case. Satiné champagne with painted baton indexes. Blued steel baton hands. Cal. 9P, rhodium-plated, fausses cotes decoration, 18 jewels, straight-line lever escapement, monometallic balance, self-compensating flat balance spring, shock absorber. C. Double case, coin opening with a concealed push-piece in the band, three-body hinged inner case. D. Satiné champagne with painted baton indexes. Blued steel baton hands. M. Cal. 9P, rhodium-plated, fausses cotes decoration, 18 jewels, straight-line lever escapement, monometallic balance, self-compensating flat balance spring, shock absorber. Dial, case and movement signed. DIAM. 35 mm. THICKNESS 4 mm.